This is the kind of answer one can give to curious people asking what one is reading. And it gets even more fun when you can say that the book is about nothing. In reality though reading about nothing seems to be quite a good idea, at least the way nothing is described in this collection of articles by various scientists from such different fields such as biology, astronomy, medicine, mathematics etc. For example what is left if you take everything out from an area of space? Is it really nothing, or is there still something? Or why exactly do some animals do nothing for the most part of their days? Sloths for example – moving along slowly, if at all, which seems as if their not really spending their time here usefully, but apparently there are sound scientific explanations for that – in case of sloths for example it’s to do with their metabolism. But then there are also ways in which nothing has more to do with our everyday life – placebos for example, when there’s really no medicine except for a sugar pill, and the patients still start to feel better. 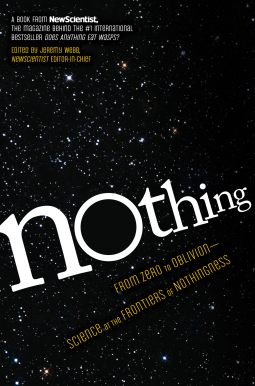 Reading about nothing was an interesting undertaking, as I would not have been able to come up with so many fascinating “nothings”, as are described in this book. I received this book for review purposes via NetGalley. This entry was posted in Non-fiction and tagged book review, New Scientist, Nothing. Bookmark the permalink. Fascinating and very existential. I’m curious about this title and that means I definitely need to check it out! Nice review!